Representing the ease of coffee making, the Pura Fresco is the machine for businesses that want to offer more than just the standard black and white coffee beverages. 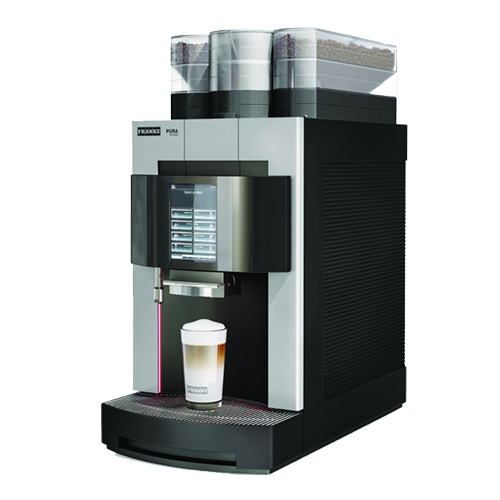 Suitable for medium-sized businesses with 30+ employees, this machine is capable of dispensing up to 120 cups per day. Enjoy total ease of operation with the latest touch panel technology. Browse the product overview on a 5-inch screen, featuring personalised symbols and text displays. This machine is a profitable long-term investment, requiring minimum maintenance requirements and overheads. The modular design, easy to remove brewing unit and mixing chamber drawer make it very service friendly. The timeless design and modern look make the Pura Fresco a real attraction in any establishment, blending very easily into any environment. The user-guided cleaning is shown on the colour display with friendly symbols and text. Pressing the wipe function will disable all the display buttons for 20 seconds so that the panel can be cleaned. Using the Pura Fresco is simple – the coffee it delivers is anything but. Pura Fresco not for you?